Actually, it’s not that shocking. Tait Shanafelt MD and his group at Mayo Clinic reported in 2012 on a study of 27,276 physicians from the AMA Masterfile (7288 physicians returned their survey). Nearly half reported at least one symptom of burnout. The highest rates were in front line specialties – family medicine, internal medicine, emergency medicine. Other data shows that 12% of male and 18% of female physicians report being depressed. 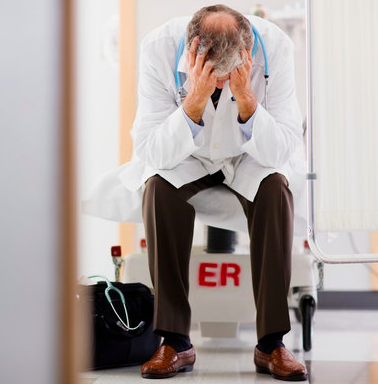 300-400 physicians commit suicide each year. With all the changes in healthcare, how could we not feel off balance? But given that the changes are eroding physicians’ autonomy in making appropriate decisions for patients, depriving us of the time to carefully consider what’s best for each patient, and undermining the fulfilling relationships that give meaning to medical practices, how could we not feel unhappy? So I wonder, when are we going to do something about it? Ahhh…you wonder. What can we do? For one, we can look to the literature. Shanafelt et al showed that a biweekly, hour-long facilitated group for physicians, incorporating mindfulness, reflection, shared experience, and small group learning for 9 months resulted in significant improvement in empowerment and engagement at work; decreased feelings of depersonalization, emotional exhaustion, and overall burnout; and an improved sense that their work was meaningful. Mayo Clinic gave each participating physician paid time off for the group – certainly a wise investment, given the cost to the medical group of keeping or replacing a burned out physician. Another effective intervention was a 12 week program of exercise, which resulted in a significant increase in quality of life and a decrease in the feeling of burnout among residents and fellows at Mayo Clinic. A study of first year residents revealed that practicing mindfulness and self-compassion were the most effective building blocks for resilience and protection against burnout. Gail Gazelle and her group in Boston reported on the success of personal coaching to provide physicians with an enhanced sense of personal power, connection to their work and alleviation of symptoms of burnout. In our offices, we can create reasonable expectations for ourselves and erect the necessary boundaries with our patients to sustain them. Letting patients know how much time we have to care for their concerns can help us prioritize with them the most pressing or bothersome issues. Explaining that we WISH we had more time, but will be happy to address the remaining concerns at their next visit, allows us to teach patients what they can expect. Individually, we can each spend a few minutes each day focusing on our successes, rather than our failures. Daily entries in Rachel Remen MD’s Three Question Journal can help us notice the joy that already exists within each day: What surprised me today? What moved me or touched me today? What inspired me today? So let’s take a stand for our profession and our lives. While the winds of change continue to buffet us, we have strengths we can harness, perspectives we can shift, and concrete, proven strategies we can implement to begin to restore our love of being a doctor. This entry was posted in Doctor Coach, mindfulness, physician burnout, physician coach, physician coaching, physician fulfillment, physician work life balance and tagged medical career, perfectionism, physician burnout, physician coach, Physician coaching, Physician work life balance, success. Bookmark the permalink.